I've recently downloaded the Named Sloane Sweatshirt and made my first version. I had some camo-print sweatshirt fabric stashed away and decided to put it good use. I love how it looks and it's definitely a piece I'll wear often but I feel like being a bit more adventurous for my next version (or two). Here's a little inspo I gathered together to refer back to for my future makes. 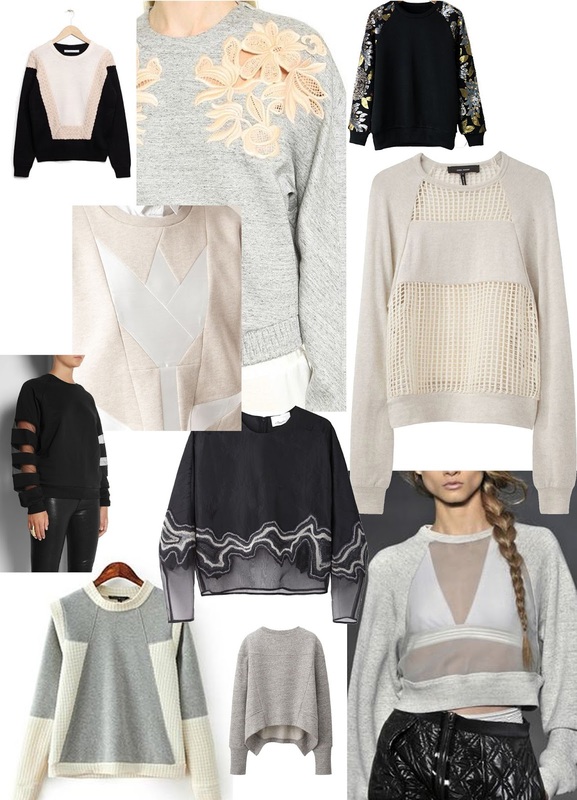 I love the idea of colour blocking or using different panels of textures. I'm also super fond of tassel's and fringing (who isn't) so maybe they will feature somewhere too? All images can be found on my pinterest board here. This free pattern was released by Marilla way back in 2014, so, as per usual, I'm a little late to the party. I drifted away from sewing garments last year, getting stuck into other things and generally just lost my love for it. I had however managed to keep collecting/hoarding fabrics with the premise of future use. So the time came to get out of my sewing slump and start turning these fabric lengths into something more wearable. 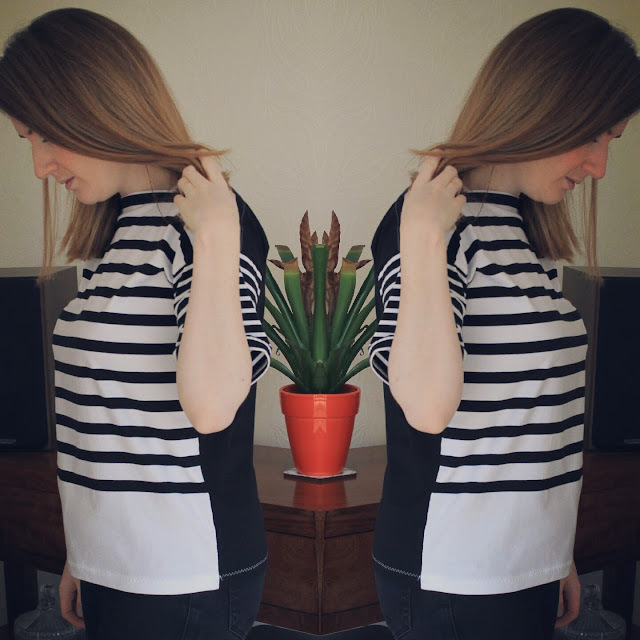 This Sailors Top pattern was the perfect thing to ease me in and I instantly fell in love with the shoulder gusset detailing and the ease and quickness of everything coming together, having something I could actually wear in just a couple of hours. 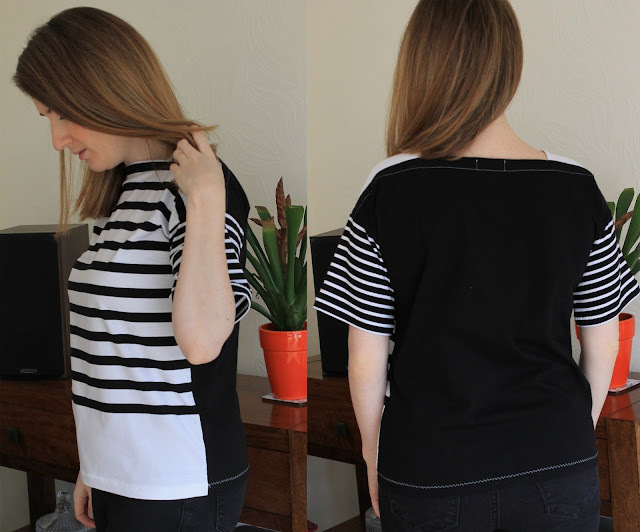 The pattern comes in one size which fits a UK12, but as the top is essentially made up of rectangles, it's really easy to adapt the pattern to your measurements. 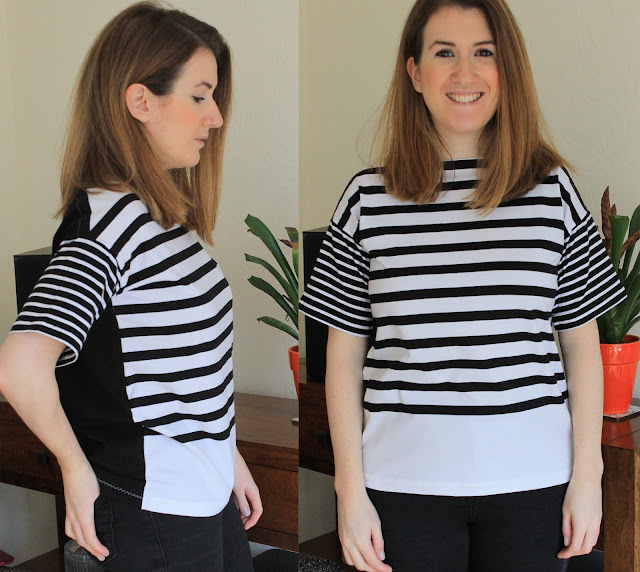 I made the top up in a grey jersey in a size 12, with the underarm gussets, to see how it fitted on me and make any adjustments if needed. I found the top a little loose for my liking and for future makes, would take it in by 2.5cm on the pattern and omit the underarm gussets. There's an optional pocket and dress option too! 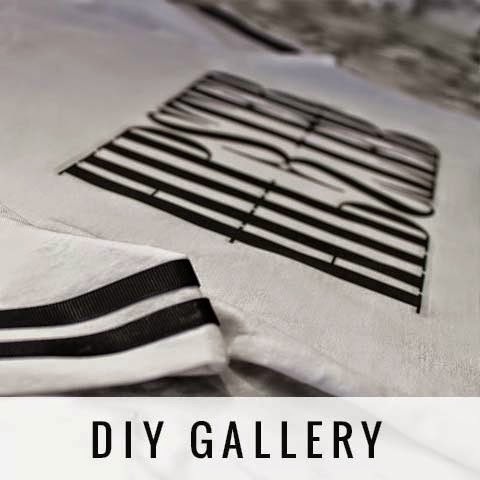 The instructions are well laid out and clear to follow, it takes almost no time at all to sew and you could have yourself a new addition to your wardrobe in a morning or afternoon. It seemed fitting to make my first one out of a striped, looped back jersey. The fabric is a little heavier than a t-shirt weight jersey but not as heavy as a sweatshirt fabric, so I made a top which is somewhere in between the two. Tapered the sleeves to 27cm at hem width. 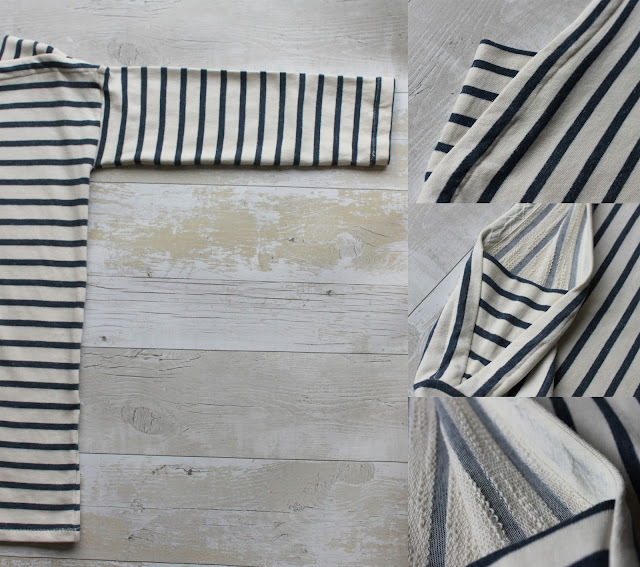 The inside of the neckline is stabilised with bias tape to prevent any drooping or sagging. I wear a lot of grey and black and wanted to incorporate some more 'simple' tops into my wardrobe and had this lovely, soft, grey marl jersey that seemed perfect for Sailor top number 2. 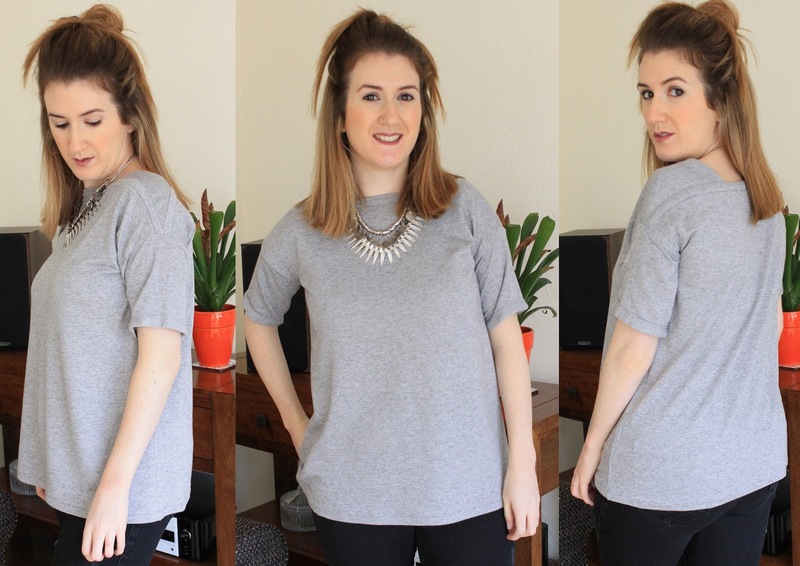 It's so comfy to wear and is great for throwing on with just a pair of jeans, but feels more special than just a plain old tee. I added 10 cm to the length for this one, turn-ups to the sleeves and tapered the top slightly so it was wider at the bottom (by 2.5cm). Version 3 is my monochrome colour-blocked tee. 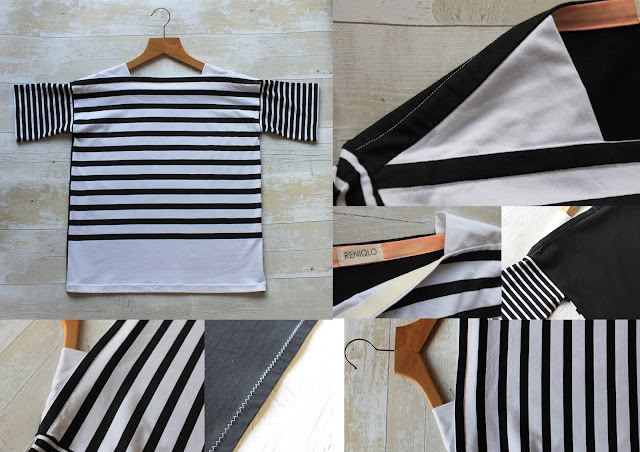 I had a lot of smaller pieces of jersey in black, white and b&w stripe and wanted to incorporate them all together. I think it turned out really well, it's definitely not something I'd normally wear but once I'd made it, I knew it was worth the experiment. I kept the sleeves the same as the original pattern and just added a little on for the length. I had fun with the binding for this one, adding a pop of colour to the inside. I also did all my stitching in white so it really stood out against the black fabric. Marilla is a brilliant pattern-maker and seamstress and you should definitely go check out her blog if you haven't already! She has some awesome patterns for sale in her Etsy shop and some awesome FREE patterns available here too, with the fresh release of the Rose jacket. I now have my sights set on the Roberts Collection. Shibori is a form of tie-dyeing which originates in Japan. Areas of fabric are folded, wrapped, twisted or pleated in special ways and then secured with string, rubber bands or clamps. The fabric is then dyed with unique patterns emerging when the fabric has been untied or unwound. 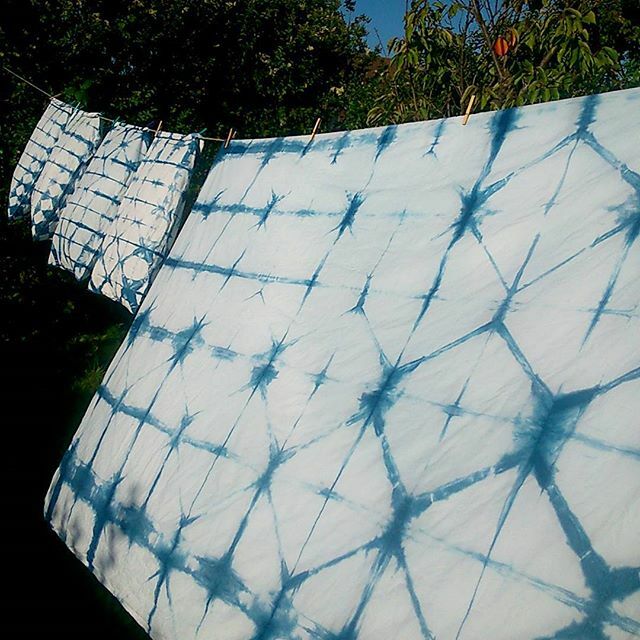 Shibori is also often related to the tradition of Indigo dyeing, a natural dye process which has long been used in many different cultures around the world. Indigo is a natural dye extracted from plants and is one of the oldest dyes used for colouring fabrics. I have always had a love for the rich, vivid blue hues from using indigo dye, and when paired with crisp white, the two remind me of the crashing blue waves, cloudy blue skies and delicate blue and white porcelain. 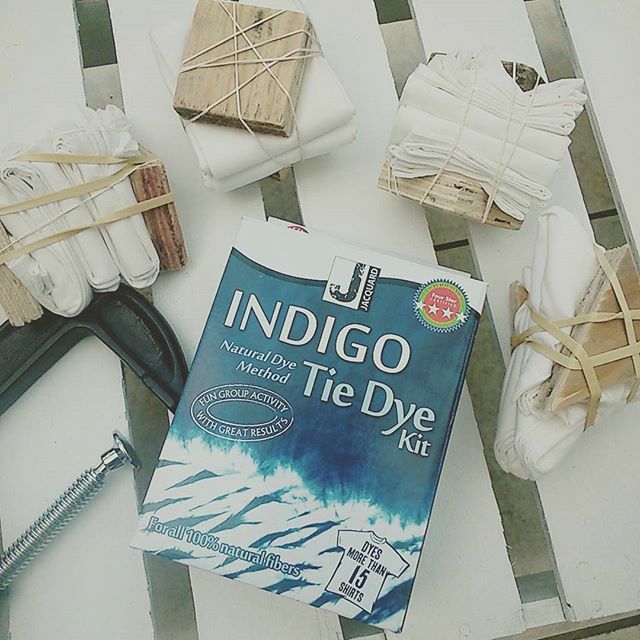 I've often experimented with tie-dye and reverse tie-dye in the past and have wanted to try dyeing with Indigo in what seems like forever. So, with aspiration to create a new bedroom space and decor based around an Indigo, white and copper colour palette, now seemed like as good a time as any. I picked up an Jacquard Indigo Tie Dye Kit from Amazon and this 100% cotton double duvet set from Ikea. When choosing your bedding, fabric or clothing to dye, you need to look out for all natural fibres, cotton, wool, silk and linen, for example. Pre-wash your item(s) before dyeing to remove any 'finishes' to the fabric and allow for shrinking. The instructions that came with the kit was easy, most of the hard work had already been done. All I had to do was set up the dye vat and and follow each step. The hardest bit was deciding on which technique to use. I decided to use the shape resist technique Itajime. For this technique, fabric is laid in accordian folds and sandwhiched between two identically shaped and sized boards. This is then all held in place by clamps, string or rubber bands. When the fabric is dyed, the bound areas act as a resist meaning a fairly regular pattern is produced. I folded my duvet cover and pillowcases using this technique, folding them into triangles and used rubber bands to hold the wooden triangular boards in place during the dyeing process. So, now that I've tried it I can't wait to experiment more. It's such a versatile craft, there are so many options for creating different patterns and it's super easy with an almost instant reward. I'm pretty pleased with how my bedding turned out. The duvet cover was quite awkward to fold pecisely and it was quite bulky when folded, so was a little tricky to hold in place, but I got there in the end. You can see how the pattern and dye is more concentrated around the outer edges, where the middle has a softer blue hue and less pattern definition but I still think it works. Perhaps a larger sized triangle with less folds would produce more pattern definition? The thing I love about dyeing fabric in this way is that it's only semi-guaranteed to turn out a certain way, with lots of beautiful surprises and patterns awaiting, depending on how and where the dye finds its path. I love the results and am already deciding what to dye and what techniques to try next.